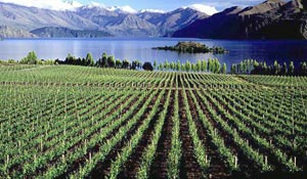 The Mills family planted their first vineyard on the family farm on the shores of Lake Wanaka in Central Otago in 1982. Though Riesling, Gewürztraminer and Sauvignon Blanc are grown, also some Gamay and Osteiner (a German crossing of Riesling and Sylvaner), it is Pinot Noir that has made Central Otago famous in recent years, and Rippon are acknowledged as making some of the best examples. I met up with winemaker Nick Mills (right), son of the founders Lois and Rolfe Mills, who was in London with Rippon’s UK distributor, Lea & Sandeman. Having studied winemaking in Burgundy and worked at Domaine JJ Confuron, Domaine de la Vougeraie and Romanée-Conti, he returned to New Zealand in 2002, and now takes charge at this biodynamically-farmed estate. Quantities of the single block Pinots, Emma’s Block and Tinker’s Field, are minute: 87 and 85 cases respectively in the 2008 vintage, whilst the regular Pinot is still in limited supply, but available through Lea & Sandeman and other UK stockists. Today, the total area under vine is 15 hectares, with the majority of plantings Pinot Noir and Riesling. Vines are planted in two main zones with differing soil types. 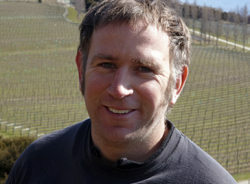 Nick says each influences the tastes and character of the wines they produce. The sub soil of both is decomposing schist with a thin covering of wind-blown loess (silt). The Lakeside vineyards sit on a relatively new base of gravel debris from an old river, whilst the Hillside vineyards is moraine: sedimentary deposits of the last glaciers, on a 50-metre-high slope. 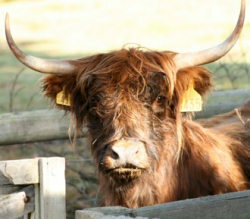 Farming aims to be as sustainable as possible, with no synthetic chemicals used and all of the estate’s organic waste recycled to make around 40 tonnes of compost every year. This is still a family business with matriarch and founder Lois Mills keeping a watchful eye, and Nick’s wife Jo as Business & Export Manager. His brothers David and Charlie are property and vineyard managers respectively, whilst Fergie (right) is one of a small herd who enjoy the organic good life in this dream location, whilst supplying one of the key ingredients for any biodynamic vineyard operation. Though the 2007 Pinot Noir is currently on the shelves at L&S, I was very privilged to taste the soon to be available 2008 vintage and the two exceptional single block Pinots. The Tinker’s Field in particular, from the property’s oldest vines planted on a gentle slope by Nick’s late father Rolfe (Tink to his friends), is a hugely impressive wine. Lovely brown sugar nose, supremely sweet black fruit with a lovely creaminess and touch of gamy, truffly quality. The palate has lovely fruit: edgy and offset by delicate notes of cherry skins and tart acidity. Delicious wine. 91/100. £27.95, Lea & Sandeman. Creamy, sweet and open, with delicious fruit sweetness and openness. An orangy brightness to the palate and acidity, tangy with a suggestion of chocolaty richness. 91/100. Lots of richness and ripeness again here, but also a leafy, damp undergrowth quality, the palate adding a silky sweetness and extra layering of flavours to the regular Pinot. The fruit is nutty and fine, with lovely definiton and such a wonderful sense of precision. 93/100. Fabulous creaminess here, a real silky impression on the nose but complex too, the coffeeish oak and more truffly, vegetal characters playing against the thick sweetness of the fruit. Quite a tight character on the palate, beautiful fruit definition, fabulous richness and sweetness, with terrific chocolaty density and suppleness to the tannins. Massively impressive. 95/100.